How to produce polymer reinforced, high tensile strength concrete having high crack resistance. Please Test First - trials prior to actual use are essential! The aim here is to outline the method and cost of producing water-reduced, polymer impregnated hardened Portland cement bound concrete which could feature when set and hardened low shrinkage and cracking potential and when compared with un-admixtured plain concrete, higher resistance to the ingress of chloride water solutions and higher ultimate tensibility and flexibility. Please Note: not the normal semi-flowable 80mm slump. 1. 0.4kg of ‘Ability’s Cosmotron® DPU-AC powder, high purity, super water reducing/super plasticising admixture, per 100kg of cementitious binding material is then added to the concrete. The addition of this highly dispersible performance enhancing admixture with additional mixing of the concrete will at the transit mixer’s mixing barrel speed (see page 2), increase the concrete's consistency to the more flowable normal 80mm slump approximately. This dose rate is approximately equal to 1.25kg Cosmotron® DPU-AC powder per cubic metre (m3) of concrete which is to contain approximately 310kg of cementitious binding material such as an N25 (25 MPa compressive strength at 28 days) premixed concrete Paving Mix. 2. Then also add to this concrete four (4) litres of Ability’s liquid Admix 2000® liquid latex admixture per 100kg cementitious material. This is a flexibilising, supplementary binding polymeric acrylic resin based, cement modifying and bond increasing admixture for concrete. This dose rate is approximately equal to12 litres Admix 2000® per m3 of this concrete (to be added to the unset plastic concrete mix separately to Cosmotron® DPU-AC). After the addition of these two concrete admixtures and re-mixing the concrete in its transit truck barrel at the mixing speed for ten (10) minutes, the concrete is placed at a 80mm slump without the addition of further water. (Cosmotron® DPU-AC powder substantially decreases the concrete batch mix water requirement for a given slump so that the ultimate compressive strength of the Ability admixture modified 25 Mpa concrete grade should be increased to around 32 MPa). 1. A non-air entrained, non-bleeding 25MPa, premixed concrete paving mix design consisting of a minimum of 310kg cementitious material / m3 is considered optimum for the production of low shrinkage hardened concrete with low cracking potential. Mixes having higher cement contents may result in potentially higher creep (dimensional change under sustained load) and higher shrinkage characteristics long-term - particularly 90-180 day shrinkage which causes cracking and are therefore counterproductive to the achievement of hardened concrete having the lowest shrinkage, cracking and dimensional change potential. 2. This Ability multi-purpose dual admixture system can, depending on the Admix 2000® dose rate, increase tensile and flexural strength of hardened concrete but the system is not recommended for compressive strength (crushing) testing of concrete after standard concrete laboratory water bath or ‘fog room’ moist curing at the relative humidity of 95%. Admix 2000® modified concrete tends to be self-curing. Therefore compressive strengths should be tested, if required, after moist curing for either 7, 28, 91 or 365 days etc. after the cylinders of hardened concrete are allowed to dry in laboratory air for an additional 3 days at typically normal room temperature (approximately 23ºC) and having typical humidity conditions (ie a relative humidity of 50%). Admix 2000® slightly retards compressive strength development of concrete per unit time but does not inhibit it whilst the concrete’s flexibility is increased. 3. Even higher flexibility and tensibility of fully hardened concrete may be potentially achieved by increasing the dose of Admix 2000® by up to a factor of six (6) times. (ie up to 24 litres/100kg cement) to result in potentially substantial flexural and tensile strength increases. However, a relative glue-like 'stickiness' of the plastic concrete will increase proportional to the dose rate and may in practice become difficult to handle. Please refer to the Ability Product General Information Sheet for Admix 2000®. 4. All current recommended procedures, practices and codes - particularly AS3600-2001 "Concrete Structures" - for site placing, handling and processing of pre-mixed concrete (placement, including the correct type, amount and site positioning of steel re-enforcement rods or mesh on bar chairs, compaction by a satisfactory vibration procedure to eliminate air bubbles in the concrete, adequate concrete jointing, finishing and curing) should be specified and adopted. 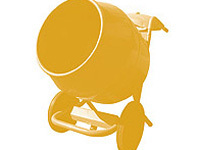 Due to its water retaining emulsion properties, curing, (ensuring the retention of the concrete mix-water by a suitable procedure to prevent it from evaporating from the concrete after it sets over a period of month or so), is not considered essential in fair weather conditions at dose rates of Admix 2000® in concrete exceeding 15% by weight of cementitious binding material, but may still be specified if required. 5. Compared with plain un-admixtured concrete of the same mix design and water to cementitious binder content (w/cb ratio) Admix 2000® polymer reinforced, water reduced hardened concrete’s potentially have higher, flexural, tensile, impact, abrasion and adhesive bond strengths at 28 days, the increase of which are related proportionally to the dose rate of Admix 2000® liquid acrylic latex polymer resin admixture - and the same (or very slightly lower) compressive strengths. If it is considered important to insure that the compressive strength of this modified concrete remains the same at 28 days, a small extra amount of Portland cement may be specified for inclusion in the concrete (usually about 10% by weight per cubic metre) with a suitable modification to the overall mix designs. 6. Both of the aforementioned Ability admixtures for concrete, and any other approved, compatible admixture(s) added to the concrete - eg. an approved non-chloride based set accelerating or a set retarding admixture, but NOT an air entraining admixture (AEA) which is strength reducing, are to be added separately to the plastic concrete and re-mixed for ten (10) minutes at mixing speed after batching all the basic concrete raw materials including the mix water with an adequate, satisfactory initial mixing time of five (5) minutes. 7. Best results are achieved when the basic concrete raw materials are batched in the usual way including the mix water (at least 25% less mix water than the normal amount), without the addition of these Ability admixtures. This allows the cementitious material to be ‘wetted out’ before the addition of the admixtures and avoids the occurrence of set time retardation.The concrete is then thoroughly mixed in the concrete transit truck mixer (for five (5) minutes at the ideal mixing barrel speed), ie order the N25 (25MPa) concrete at a consistency of a 40mm slump. Cosmotron® DPU-AC powder and Admix 2000® liquid are then separately added into the transit truck mixer barrel containing the plastic concrete. The load of admixtured concrete is then re-mixed for ten (10) minutes at the mixing barrel speed prior to discharge at a consistency of about a 80mm slump in the normal way and by normal means. The on-site addition of Cosmotron® DPU-AC powder and Admix 2000® liquid admixtures with subsequent thorough re-mixing is in addition to the other benefits stated, intended to increase the consistency of the concrete from a slump of approximately 40mm to around 80mm without the addition of extra water. DO NOT USE THESE SUGGESTED CONCRETE MIXES WITHOUT ADEQUATE PRIOR LABORATORY TESTING. TRIALS ARE ESSENTIAL! For additional information, please contact Ability. Also kindly refer to separate printed information / product data sheets (PDS)for liquid Admix 2000® as well as for the instantly dissolving powder based combined superplasticiser and super water reducer Cosmotron® DPU-AC - both are available on request. Admix 2000® white latex liquid admixture is now also available as a 100% solids powder under the Ability trade name abil-strength® super polymer powder. To prevent an excessive reduction in concrete density and strength do not add an air-entraining admixture (or mortar ‘plasticiser’) to concrete mixes containing Admix 2000®. Latex polymer modified concrete is used in such applications as the repair of damaged concrete and asphalt pavements, bridge deck concrete, high bond strength pavements and flooring topping mixes etc.